For weeks I have been planning a birthday party for my sister, Sly. Her husband, MEW, myself and my father all combined our efforts and put on a party celebrating my sister's 30th birthday. Of course, my responsibility was decorations, invitations, and desserts. This was my first official Pinterest party. I have been stockpiling fabulous ideas for parties on my Pinterest boards and I was thrilled to have the opportunity to use them. The first task on my agenda was the invitation. I searched online and found such incredible invitations. However, they also came at incredible prices - but not in the arena I was playing in. So I went to Target and bought blank, imprintable invitations. I thought these were cute, whimsical, and very Sly-like. GB and I don't own a printer. There is a long, embarrassing story behind this - but I'll cut it down. I had the opportunity to get a free printer, but I turned it down because I did not have a desk to put it on. I'm too cheap to buy one, GB doesn't need one, so we live without. But I can promise you - this won't last. There are too many cute fonts in this world for me not to print menu cards for every meal I serve. I printed the invitations at work, on the sly for my Sly, and I printed in a hurry. I loved how it turned out. 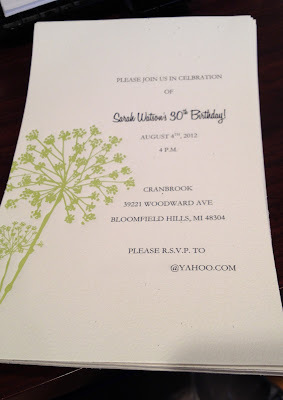 But as I printed the last invitation, I realized there was a slight problem. We were having a 'Celbration', not a celebration. I definitely smacked my forehead when I realized what I did. 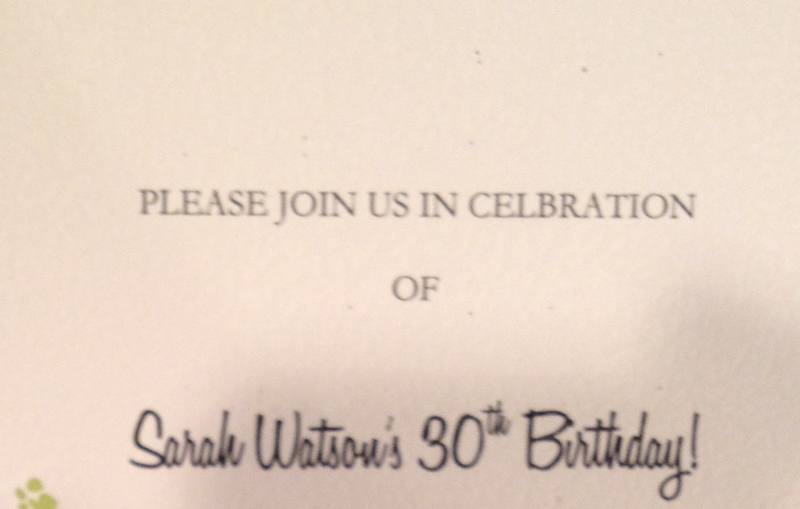 I had no choice but to send the invitations out. The party date was rapidly approaching. If I didn't send them now, I couldn't guarantee we would have guests at the party. Summer weekends are booked fast and I wanted to assure my sister that her dearest friends would be there. I swallowed my pride and attached the stamps. We rented a beautiful cabin which served to be a great location for a birthday party. I wanted to document the entire occasion in a homemade photo booth. I loved the idea from Mom Tog to use paper chains as a backdrop. It was really surprisingly soothing to make loop after loop while sitting on my couch during a Friday Night Lights marathon. I set up a borrowed tripod and our camera in front of the paper chains. I had a (not pictured) sign posted with the instructions to find a friend and a take a picture. While the paper chains were cute, they didn't necessarily serve the intended purpose. Unfortunately, we had some rain drizzles on and off throughout the day, so we had to keep moving the camera indoors. Additionally the crowd mostly buzzed about away from the paper chains, so it was easy to miss. Next time - the 'photo booth' will be indoors. I was most excited for the following project. 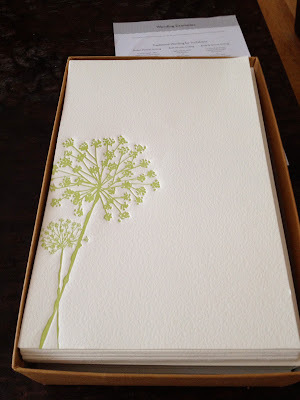 The Picture Perfect birthday wall by Martha Stewart has been something I've been dying to try. I gathered great old and new photos of Sly and made black and white copies. I originally intended to post the photos directly on the cabin, but the tape I was using refused to stick. Instead, I used a portion of plastic table covering as a backdrop. Our entire family was happy I included some of the 'Not-so-hot' years as well as gorgeous photos from her wedding day. Using scrapbook paper and chipboard letters, I created a cute and quirky birthday banner. I was thrilled with the outcome and will definitely remake this again. Using another fun idea from Pinterest, I cut a star out of poster board, and sprinkled flour on the lawn through the homemade stencil. It turned out well, but next time I would use a larger, thicker poster board with extremely defined edges. I was happy with the outcome, no matter how imperfect. Lastly, I created evening lighting using old wine bottles, citronella oil, and tiki torch refill wicks. I borrowed the idea from When Pigs Fly. The flames sometimes died out, but my Dad helped me soak the entire wick by twirling the bottle, and voila, we had flames. The only downside was the lack of funnel. I eventually gave up making makeshift funnels out of zip lock bags and cups and poured the oil straight into the bottle. Surprisingly, that worked the quickest and cleanest. These cute party decorations did not necessarily keep the bugs away, but did bring on the compliments. I will be using these from now on at every outdoor party. Overall, the party was a huge hit. A few rain clouds and mosquitos could not stop us! I was so happy to be a part of Sly's 30th birthday. I love my sister more than anything - and I can't wait to celebrate your next birthday!